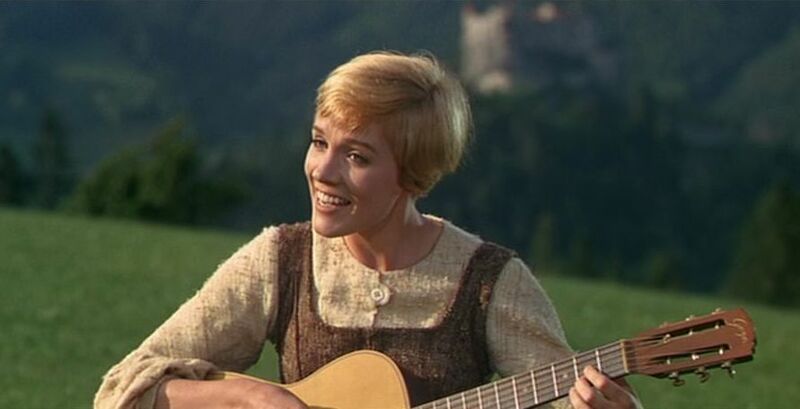 The Sound of Music (1965) was a culminating film of Hollywood’s Golden Age of musicals and still stands as one of the most popular films ever made. The film was an adaptation of the hit Broadway musical stage production The Sound of Music (1959) and was the last work of the legendary Rodgers & Hammerstein team – the music composed by Richard Rodgers and the book and lyrics written by Oscar Hammerstein II (Oklahoma!, 1955; Carousel, 1956; The King and I, 1956; and South Pacific, 1958). Their music, of course, is a crucial aspect of the work, but there are other interesting elements that also contributed to the film’s great popularity. In particular, Julie Andrews’s captivating performance in the lead role and Robert Wise’s astute direction are particularly notable. The story of The Sound of Music concerns a young postulant nun who takes leave from her nunnery to be the governess of a retired navy captain’s seven children. Set in Austria just prior to and after Nazi Germany’s annexation (Anschluss) of that country in 1938, it is based on the real-life experiences described in Maria von Trapp’s memoir, The Story of the Trapp Family Singers (1949). During this account, Maria wins over the hearts of Captain von Trapp’s unruly children and teaches them how to sing. She also falls in love with and marries the Captain, and together they all manage to escape Austria before the Nazis can conscript the Captain into their military. Captain von Trapp’s narrow escape from the Nazi clutches. It is Maria’s loving engagement with the world through music that dominates this story. 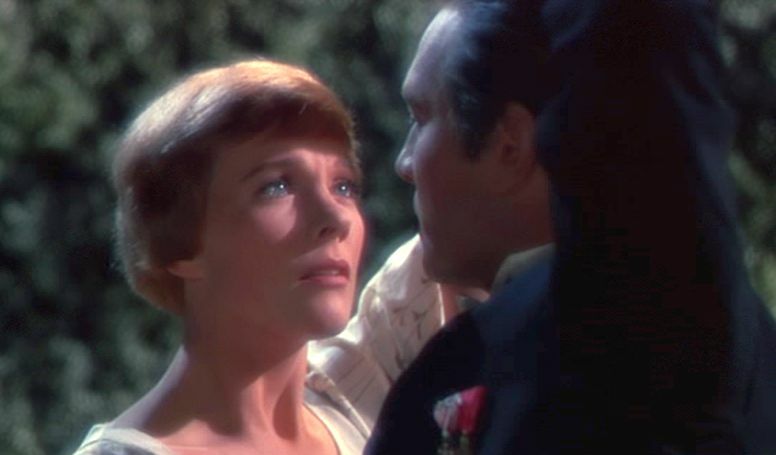 This led to the film’s diminution of other presumably key plot elements of the stage play’s story, such as (a) the contrast between Captain von Trapp’s idealism and his cynical friend Max Detweiler’s willingness to compromise with corruption in order to maximize his own utility and (b) the Captain’s tepid romantic relationship with the wealthy Baroness Elsa von Schraeder. This shift in focus has its downside, but it is compensated for by the richness in treatment of Maria’s soulful nature through the dynamic presentation of the musical numbers. In this regard Wise and his team came up with skillfully edited montages for the musical numbers, which released them from the confines of a static stage production and took advantage of cinema’s vastly more expressive possibilities. In keeping with the Hollywood musical tradition, The Sound of Music’s tale is presented in two acts separated by an intermission, with the first and longer act containing most of the musical numbers and setting the overall mood, and the second act featuring a dramatic turn in the plot. 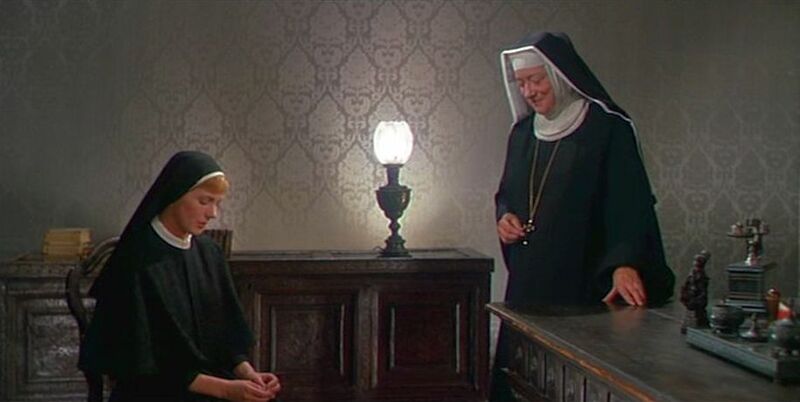 The film opens by introducing the viewer to the vivaciously free-spirited young postulant nun Maria (played by Julie Andrews). She is first seen outside reveling in nature and bursting into the title song, “The Sound of Music”. But the sisters in the Salzburg abbey where she is studying dismiss her in their song “Maria” as a flibbertigibbet and a clown. 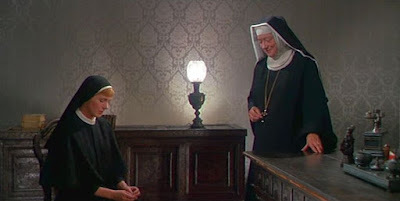 The Mother Abbess (Peggy Wood) recognizes Maria’s insouciant nature and decides that life inside the abbey may be too confining at this stage in the young woman’s life. So she assigns Maria to be a temporary governess for the seven children of recently widowed Captain Georg von Trapp’s (Christopher Plummer). When Maria meets the von Trapp family, she sees that the Captain is remote and obsessed with discipline, while his children are unruly and rebellious. Many of the memorable songs in this act, including “My Favorite Things” and “Do-Re-Mi”, show Maria engaged with the children and winning them over with her loving nature. She teaches them how to sing as a group, which will become an important plot element in this story. 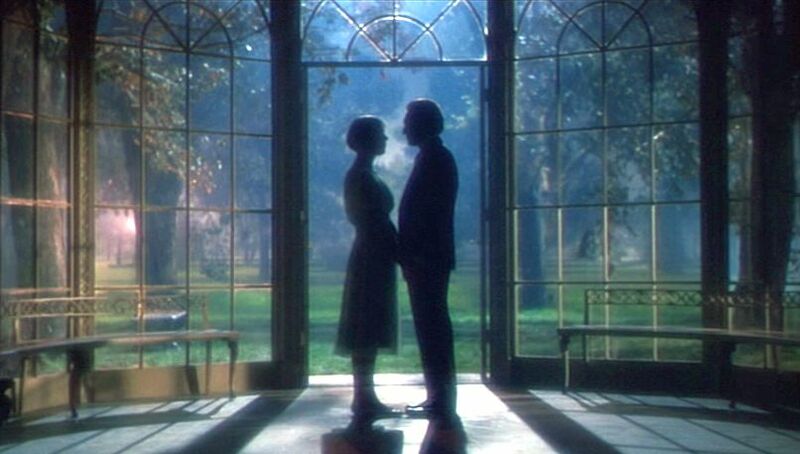 Meanwhile there is an interlude scene showing 16-year-old Liesl, the oldest von Trapp child, having a secret meeting with her boyfriend Rolf and the two of them singing to each other the song "Sixteen Going on Seventeen". After a trip to Vienna, the Captain returns with his romantic interest, Baroness Elsa von Schraeder (Eleanor Parker), and their humorously cynical friend Max Detweiler (Richard Haydn). Upon seeing his children frolicking with Maria, he fires Maria on the spot. But shortly thereafter when he hears how beautifully his children have learned to sing under Maria’s tutelage, he humbly recants his dismissal. Later the Captain is regaled by the children’s and Maria’s musical puppet show, “The Lonely Goatherd”, and of the many well presented and time-edited musical numbers in the film this scene stands out as one of the best. The Captain is then subsequently moved to sing for them, himself, the metaphorically patriotic ballad “Edelweiss”. Maria and the Captain briefly dance together and exchange instinctively tender glances. This rush of feeling makes Maria blush, and she backs away. Later, after the children say good night by singing the coordinated “So Long, Farewell”, Baroness Elsa, who suspects something is brewing between The Captain and Maria, goes to Maria’s room and convinces her to return to the chaste world of the abbey. With Maria now back at the abbey in seclusion, The Captain announces to his family his plans to marry Baroness Elsa. The children, missing their dear tutor and companion Maria, are underwhelmed by this news. Meanwhile at the abbey, Maria confesses to the Mother Abbess her confused feelings that caused her to flee the von Trapp household. The understanding Mother Abbess tells Maria that she must follow where her pure heart leads her and that she should return to the von Trapp family. Underscoring her advice, the kindly woman then sings the inspirational “Climb Ev’ry Mountain”. When Maria returns to the von Trapp estate, the children are delighted, but she is disappointed to hear that The Captain is now engaged to Elsa. However, The Captain is now realizing his mounting feelings for Maria, and he breaks off his engagement with Elsa. In the evening he finds Maria in the garden and expresses his love for her. There in beautifully shadowed and silhouetted shots, they sing the enchanting song “Something Good”. This beautiful song was written specifically for this film by Richard Rodgers alone, Oscar Hammerstein II having passed away in 1960, and it stands out as one of the film’s finest moments. In short order Maria and The Captain are married and off on their honeymoon. While they are away, the German government annexes Austria (the Anschluss), and Max enters the children in a musical contest for the Salzburg Festival to be held on the evening that the honeymoon couple returns. When The Captain does return with Maria, he is informed that he has been conscripted into the German Third Reich’s navy, and he must report for duty immediately. Unwilling to collude with the Nazis, The Captain organizes his family to leave Austria immediately. However, when trying to escape in their car, their plans are foiled by Nazi Brownshirts following them, so they head for the Salzburg Festival to perform there. At the festival, they reprise some of their earlier songs, including a stirring rendition of “Edelweiss” by The Captain and Maria. Afterwards during the awards ceremony, the family manages to sneak away to the abbey, where the Mother Abbess and the nuns place them in hiding. But the Brownshirts, who now include Leisl’s former boyfriend Rolf among their members, are looking for their missing quarry, and they come to the abbey to snoop around. But with the help of some canny nuns, the family gets away and heads on foot over the mountains to freedom in Switzerland as the film ends. When The Sound of Music was first released, the US East Coast critical reaction was mixed, at best, but the film soon proved popular with the wider public. It received 10 nominations for US Academy Awards (Oscars), and it won five of them, including for Best Picture and Best Director. By the following year, the film had become the highest grossing film of all time, surpassing Gone with the Wind (1939). Despite the film’s great popularity, though, we can identify some weaknesses in the storytelling. In the course of streamlining the stage play for the film, one of my favorite songs from the musical play was deleted, “No Way to Stop It”. This was sung mainly by Max and Elsa in the early part of Act 2, and its removal was part of the diminution of those characters in the film. Some liberties were taken with historical reality. Since this is a story about a real person, some caution should be exercised in making these alterations. For example the film’s narrative collapses into a single year events that were spread over at least twelve years in Maria von Trapp’s account. Their departure from Austria was also different from what was depicted in the film. We are not shown enough of Captain von Trapp’s persona and charm to justify Maria’s falling in love with him. The acting of the von Trapp children is rather artificial, even for a musical play. Captain von Trapp’s breakup with Baroness Elsa is artificial and seems too easily accepted by her. Nevertheless, the film‘s strengths make up for these deficiencies. 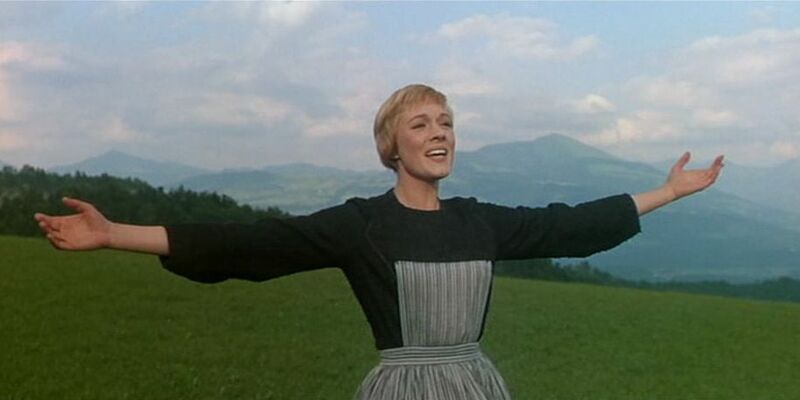 Julie Andrews’s sincerity, warmth, and charm carry the story’s main message concerning loving engagement with the world. And Christopher Plummer, who has a rather subdued presence in this story, is extremely good at conveying inner feelings through his facial expressions. This became more evident to me upon repeated viewings of the film. But it is the beautifully crafted musical numbers, with their cinematic choreography (which was completely new for the film from the stage play in order to take advantage of cinema’s wider aesthetic latitude) that carry this film. They are what make this film still worthy of a four-star rating.